No matter what sort of photography you practice, one of the fundamental aspects of good photography is to go beyond a simple record of a subject and capture the mood or ‘atmosphere’ of the moment. There are a variety of ways of doing this but, whilst it sounds obvious, the most important aspect of atmosphere creation is deciding what atmosphere or mood you want to depict. Only the photographer can do this, since he or she was actually there at the time of the shoot and would have experienced a certain sense of the location and, consequently, a clear idea of exactly what mood should be communicated to the viewer. The atmosphere, or mood, of an image could be anything from ‘bright and sunny’ and ”uplifting’ to ‘dark and forbidding’, ‘brooding’ or even ‘disturbing’. It is the tonality of the image that is often the most obvious mood-setter, low key images with predominantly dark tones are interpreted as ‘brooding’ or ‘threatening’ whilst images with lighter tones can be seen as ‘cheerful’ and ‘uplifting’. Colour plays a big part in the creation of atmosphere too. Strong, dark colours can add to a sense of intensity whilst muted, subtle colours lend a degree of lightness to an image creating a fresh, even ethereal mood. Sometimes the colour is the single most essential element of the scene, in the case of a Barrier Reef image ‘bright’ and ‘blue’ would characterise the mood of the reef at its best. Conversely, eliminating the colour entirely can actually add an extra dimension to an image. Black and White images are often seen as ‘classical’ and are quite useful for images that need a sense of history, solidity, texture etc. Colour can be distracting and using B+W allows the photographer to concentrate attention on forms and textures in addition to the overall atmosphere. The other main aspect of creating a mood is what you shoot as opposed to how you shoot it. Particularly in landscape photography there will be certain elements that are essential to creating a mood and by including these elements, the atmosphere of a scene can be clearly communicated. When choosing to shoot a scene it is important to have a good clear idea of what mood you are intending to communicate and then use this to influence your composition. Include as many elements as possible that add to the mood and eliminate those which detract from it. 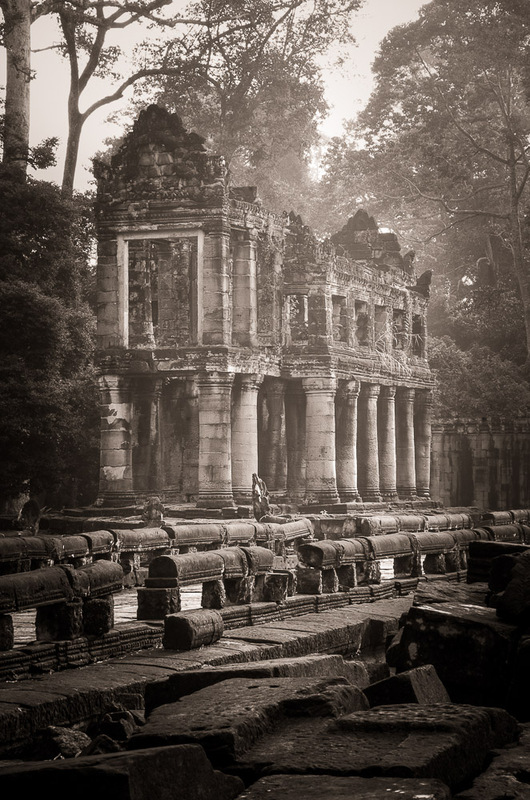 Let’s look at how I created an atmosphere of ‘ancient culture’ and ‘nature’s power’ in some images, made over a number of visits, of the famed temples near Angkor Wat, in particular the ruined temple of Preah Khan. 1. 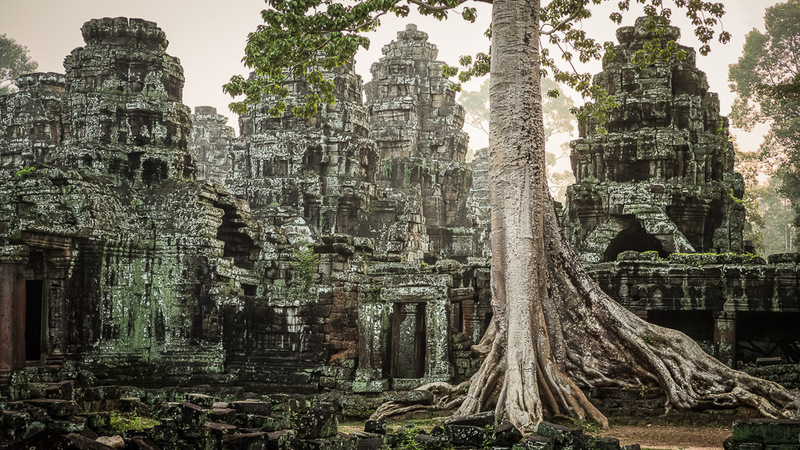 The fact that there are huge fig tree roots clutching at the crumbling stone is a clear indication of the age of the place and so to create an atmosphere of antiquity and history it was important to use this aspect of the temple to its maximum potential. 2. The temple is semi-ruined so I needed to include jumbled stones. 3. The temple is surrounded by forest so there needs to be at least some trees in the frame. 4. There are vast numbers of exquisite carvings all over the stonework, so including these is a must. Since one of the moods I wanted to portray was ‘history’, I pre-visualised the end result as being best in B+W and I chose a horizontal format to include as much as possible whilst eliminating as much bright sky and distracting foreground as possible. I also wanted detail everywhere so chose to shoot the scene in the very early morning light to minimise the contrast. It is easy to add contrast to a flat image later but almost impossible to remove it from a harsh one. I also shot it as a multiple exposure to keep detail in the shadows – this is a technique that I talk about in great details during my various Akademie workshops. 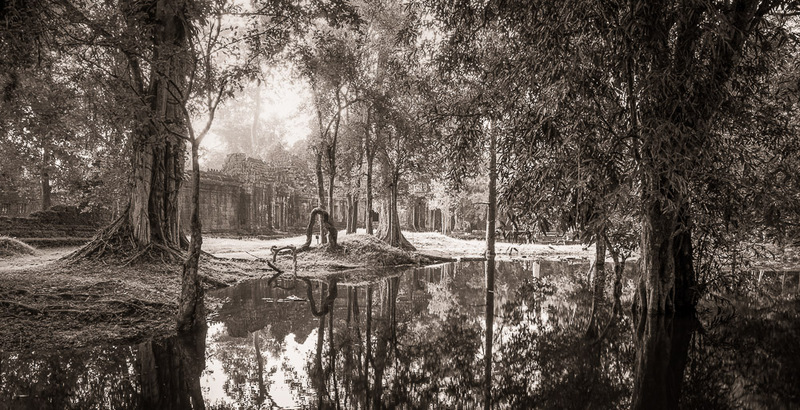 Preah Khan : Leica M, 50mm Lux. I think the B+W images work best, although the colour one above is only really grey tones and a bit of green so it’s almost monochrome. For more details about B+W photography and processing I’ll be going into great detail about all aspects of the process during my Akademie B+W Workshops in November and December. 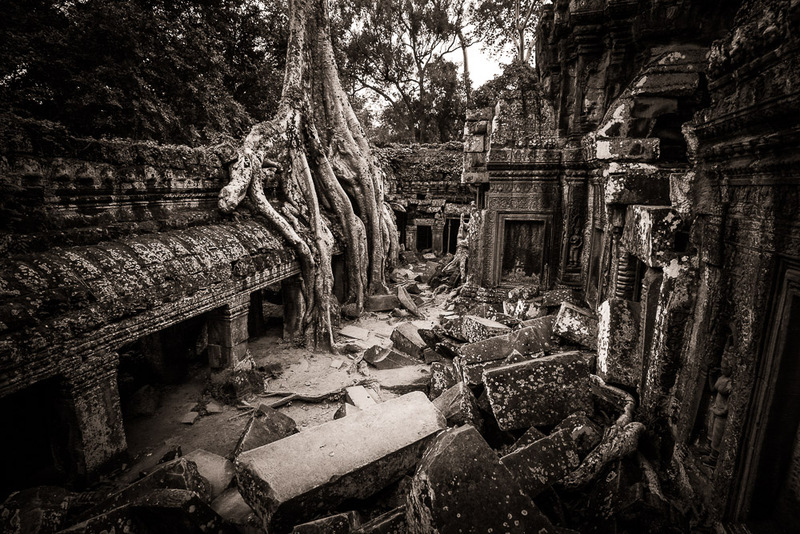 And of course if you like the images themselves, well you could have a chance to shoot them yourselves on the up coming Leica Akademie photo tour to Cambodia next year where we will be visiting these exact places as well as many more. Full details are not finalised yet but it looks like being October 1-7 2017. Watch the Akademie newsletter for details.